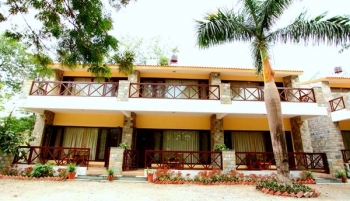 Corbett Infinity Resorts is luxury 4 star hotel in Corbett National Park spread over 22 acres of land, is one of the top hotels in in Corbett. Experience the excitement of wild adventure with modern luxury at Infinity Resorts. It is an Eco-friendly lodge located on the banks of the Kosi River. Nestled in the foothills of the Himalayas, the mountain ranges, snow peaks, lush green forests and the Kosi River - all add up to the natural beauty that will absolutely take your breath away. Infinity Resorts is an initiative of Conservation Corporation of India Pvt. Ltd. and is a pioneer in promoting responsible wildlife tourism in India. Infinity Corbett Wilderness has received a Good Practice certification from Travel Operators for Tigers (TOFT) for the environmentally sustainable and responsible tourism practices. The Infinity resorts is located 10 minutes away from the Bijrani entrance gate of the Corbett National Park. The resort remains opened throughout the year to serve the nature lovers and travellers. There are 50 guest rooms in Corbett Infinity Resorts, overlooking the Shivalik mountain ranges and the gushing Kosi River. All rooms have their own private balconies overlooking the mango grove, garden and river. The exterior of luxurious bedrooms is made with wooden trellises, stone walls and wooden staircases. Guest rooms are equipped with modern facilities, river-stone walls, high wooden-rafted ceilings and handcrafted furniture. Room amenities include tea/coffee maker, air condition/heating, mini bar, room service and attached bathroom. Infinity Corbett Wilderness houses 3 restaurants and 1 bar. The Sun Deck offers a variety of exotic drinks to make a pleasant evening. Specialty Restaurant: Conveniently located between the Golghar and the sundeck, the elegant Indochine restaurant serves authentic Thai, Vietnamese, Burmese and Malaysia cuisines. The Grill House: is a popular venue for guests to get together and enjoy pre-dinner drinks, followed by a delicious meal of tandoor and other grilled starters, soups, main courses and of course our deserts. Multi Cuisine Buffet Restaurant: all time favorite restaurant serves a wide variety of Indian, Chinese, Muglai meals for breakfast, lunch and dinner. Ideal for families and groups, travelling together, the buffet offers a delicious buffet spread and always a good way of sampling the various mutlti-ethnic and multi-cultural cuisines offered. -Musical entertainment, Angling- The lodge practices catch and release only. Fishing rods, baits, guide services available. The Infinity Resort in Corbett offers a wide variety of facilities and activities for corporate business meetings and conferences. Get special packages for group and corporate bookings.